I am Linux engineer attempting to decode my knowledge through blogging in the World Wide Web. I will share my knowledge as much as possible about Linux (what I know best) and technology in general to all my readers. Since Dyn stop offering free dynamic DNS, I have choose to use Duck DNS and I would like to share the following script I use to update Duck DNS free dynamic DNS hosted on Amazon EC2 on my OpenWrt Attitude Adjustment 12.09 running on TP-Link TL-WR1043ND v1. Please note that I am using wget in OpenWrt and the free dynamic DNS link have to change to HTTP from HTTPS. echo "# Welcome to Duck DNS Update Script"
echo "New IP $CHECKIP detected and updating current IP..."
echo "Failed to update Duck DNS..."
echo "Current IP $CHECKIP updated and old IP was $OLDIP..."
echo "No updated needed for $CHECKIP IP..."
After the above script is save as /root/duckdns.sh you can proceed to add the following line at Scheduled Tasks in OpenWrt. You need to restart cron service. This blog post describes how to install and configure Cntlm in CentOS 6.5 64-bit connecting to Microsoft ISA server to enable web browsing capability. Decide to write this simple blog post to my previous blog post Install and Configure NTLMAPS to Access ISA Server. 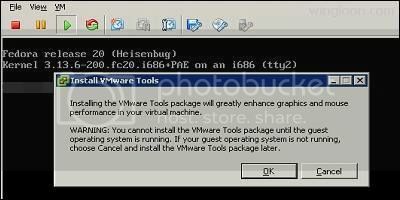 Today I would like to share with you how to install VMware Tools on a freshly installed Fedora 20 running on a free version of ESXi host. I choose basic (minimal) istallation for this Fedora 20 running on ESXi host. Finally, with all the steps above I hope you are able to use VMware Tools. Thank you.